THE future of grain growing in Australia is at a crossroads, with cropping soils suffering from falling nitrogen and soil organic matter levels that may limit yields and returns to growers. La Trobe University’s Dr James Hunt says cropping soils are suffering from falling nitrogen and soil organic matter levels that may limit yields and returns to growers. 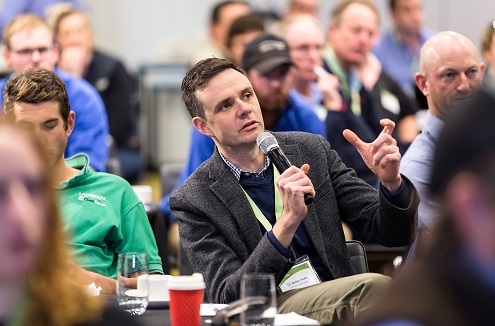 That was the concern expressed by La Trobe University’s Dr James Hunt during an agronomy forum hosted by Incitec Pivot Fertilisers in Melbourne. “In continuous cropping systems in high rainfall regions, we are mining our soil nitrogen reserves through our failure to match inputs with outputs,” Dr Hunt said. “The evidence suggests that many crops across all rainfall zones are nitrogen deficient, and this is one of the major reasons why cereal yields are on average only half what they should be. “If you look at average wheat yields across Australia, growers are achieving only 55 per cent of potential yields based on the amount of water received. Dr Hunt said nitrogen deficiency was largely to blame for the shortfall in yields. “Nitrogen deficiency is the biggest single contributor to the current gap in Australian wheat yields,” he said. His concerns are echoed in recent CSIRO research led by Zvi Hochmann and data from GrainCorp receivals in 2015-16 of which 28 per cent was only ASW wheat, which at less than 10.5pc protein, implies crop yield was nitrogen limited. Looking at the megatrends over the past 30 years, Dr Hunt said the collapse in wool prices in the early 1990s led to a decline in sheep numbers and pasture area, while the area planted to wheat grew from 8 million to 14 million hectares. “Legume based pastures fix nitrogen and crops use it, but with the swing to more crops, crop nitrogen demand has to be met with nitrogen fertiliser or from the total soil nitrogen pool,” Dr Hunt said. “The problem is that we are mining total soil nitrogen when outputs such as grain, hay and burnt or baled stubble exceed inputs such as nitrogen fertilisers, manures, compost and nitrogen fixation. “As a consequence, soil organic matter is being dragged down which is bad for soil structure and chemical properties, but the biggest negative is the decline in supply of nitrogen to crops through mineralisation of soil organic matter. Without this buffer, growers need to be prepared to make late nitrogen fertiliser applications to achieve their full yield potential. Comparing the performance of two high rainfall zones, Dr Hunt said crop and livestock production was still highly integrated in south-east New South Wales while that was not necessarily the case in south-west Victoria. “In south-east NSW, some growers have restocked and crops are grown in sequence with legume pastures such as lucerne and sub clover, which still provide a large amount of crop nitrogen demand,” Dr Hunt said. 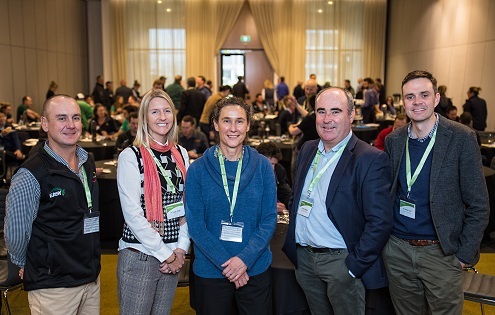 Catching up at the agronomy forum in Melbourne were Incitec Pivot Fertiliser’s Lee Menhenett, NSW DPI’s Dr Susan Orgill, Wagga Wagga, University of Melbourne’s Dr Helen Suter, Incitec Pivot Fertilisers’ Charlie Walker, and La Trobe University’s Dr James Hunt, Melbourne. Despite negative climate trends in medium to high rainfall zones, Dr Hunt said yields and water use efficiency were generally increasing due to the combined effects of better cultivars, earlier sowing, better crop sequences and fungicides. “Leading growers in these medium-high rainfall zones are averaging seven tonnes/hectare wheat yields, with some paddocks reaching 9t/ha and trials exceeding 10t/ha,” Dr Hunt said. “While these yields are supported by increasing rates of nitrogen fertiliser, most farms are still mining soil nitrogen because outputs are exceeding inputs. “In terms of the future of cropping, we are at a crossroads so we have to decide which way to go. “In high rainfall zones, we face a choice between reintegrating cropping and stock to top up total soil nitrogen from pastures or continue to separate crops and stock and rely increasingly on nitrogen fertiliser. Dr Hunt said nitrogen management in the medium rainfall zone was easy, compared with the high rainfall zone. “Managing nitrogen in medium rainfall areas starts with soil testing pre-sowing and topdressing to the calendar,” he said. “In high rainfall areas, nitrogen management is harder because high yielding crops require large amounts of nitrogen, so a 7t/ha wheat crop needs 280 kilograms/ha of nitrogen assuming 40kg/t of grain yield potential. An option to increase nitrogen applications in high rainfall regions was mid-row banding, a technique Dr Hunt described as ‘poor man’s slow release’. “In theory, mid-row banding places high concentrations of urea in a narrow band which creates a high concentration of ammonium, ammonia and nitrite which is toxic to nitrifying microbes and plant roots but allows plants to take up nitrate from the margins,” he said. “This approach means less volatilisation and immobilisation and the potential to reduce leaching and denitrification. “However, it allows plant uptake when the topsoil is dry and improves nitrogen use efficiency, and this is supported by research at Quambatook and Longerenong by Ash Wallace from Agriculture Victoria who found that nitrogen recovery is higher with mid-row banding.